travels with a bull and is in charge of it when at service; feeds, waters and grooms it; work sometimes done by head cowman (q.v.). beastman, byreman, byrewoman, cowkeeper, cowman, herdsman, neatherd, ox feeder, ox man, stock keeper, stockman; does all work required in rearing and tending of cattle; drives them to and from sheds and pasture; feeds in winter with roots and cattle cake; cleans sheds; attends cows at calving and feeds calves; on small dairy farms also does milking. as for cheese- maker (448), but also milks cows and assists generally in dairy. looks after cows grazing on public roadsides and open spaces. milks cows and works in dairy; keeps dairy and utensils clean; sometimes makes butter and cheese; may be a resident domestic servant who carries out above duties. works in dairy; turns separator or churn or controls engine or dynamo so doing; keeps dairy and utensils clean; cleans the skin of the cows daily; moves them to place of milking or feeding; milks cows twice daily; carries milk to dairy, cools it by tipping pails into cistern of water cooling apparatus and runs it from taps into cans for transit or for further use in the dairy; cf. cowman. 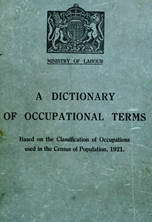 Oxfordshire, Berkshire, Hampshire and Wiltshire term; attends to feeding of horses, cattle and pigs; stores hay, green food, roots, cattle cake, straw, etc., in barns; sometimes a head man (015) (q.v.). Lincolnshire term; a cattleman (q.v.) who has charge of stock in foldyard. lives in cottage belonging to farm and acts as cattleman (q.v.). a small holder on marshland, e.g. Romney Marsh, who receives cattle and sheep sent down to graze in summer on land leased by upland farmer or farmers. milks cows, carries milk to dairy, cools it and pack# in cans, etc. ; cf. dairyman. washes dairy utensils at sink with brush, soap and hot water, where not done by dairy-maid. a cattleman (q.v.) who cleans out stalls, tips manure and litter on muck heap and works generally in cattle yard or around farm buildings.